Pra Yord Khun Phol Pim Lek Nuea Bailan Pasom Pong Gao, from Khao Or Master, Pra Ajarn Sri Ngern, of Wat Don Sala, in Pattalung. Pra Ajarn Sri Ngern (2472 BE - 2543 BE), was the Vice-Abbot of Wat Don Sala under Por Tan Nam, and was the firts apprentice in Khao Or Buddha Magic to the Great Ajarn Parn of Wat Khao Or. This amulet is a Pim Lek (small model) measuring 2.8 x 2 Cm, and is a small to medium size amulet, suitable for both men and ladies. He spent many decades traveling between Wat Don Sala and Wat Khao Or, to receive Wicha from Ajarn Parn. He was also apprenticed to the great Luang Por Kong of Wat Ban Suan, and received methods of Wicha from Ajarn Iad, and was the chief inscription maker for Por Tan Nam himself, when making Takrut, Pha Yant and other inscriptions upon Talismanic Charms. This caused Pra Ajarn Sri Ngern to become highly revered in his own right as an Adept Guru Monk of Khao or Sorcery, for holding the Wicha of lp Kong, Ajarn Parn, Ajarn Iad, and Por Tan Nam, the abbot under whom he assisted for so many years at Wat Don Sala. He also received many Wicha from Pra Ajarn Brem. He learned Traditional Healing and Medicine from Pra Ajarn Luang Por Kong Wat Ban Suan. Hed is the Monk who received the most direct Wicha transmission from Ajarn Parn of Wat Khao or, above any other Monk of those times. The amulets of Pra Ajarn Sri Ngern are very rare and highly sought after by devotees of the Khao or lineage, for their powerful Kong Grapan Chadtri and Klaew Klaad, Serm Yos power. He made various amulets including the Pra Somdej Nava Loha metallic votive tablet (2524 BE), The Pra Gleep Bua Pong Wan Ya (2526 BE), Hwaen Pirod, Pid Ta Nuea Chin, Pra Khong Khwan Wan Ya Por Tan Nam (2513 BE) and the ultra famous Pra Kring Siri Wat Medicine Buddha statuette from 2534 BE, which celebrated Pra Ajarn Sri Ngern's honorary status of Pra Kroo Sanyabadtr, which was awarded to him in that year. 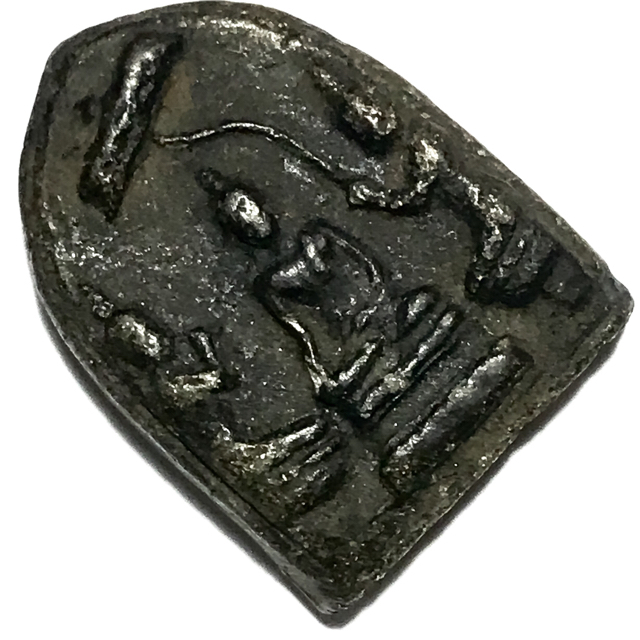 In addition many Pra Kru hiding place burial amulets were made by Pra Ajarn Sri Ngern, which he would dig up on occasion from their chamber and distribute. Pra Ajarn Sri Ngern Apataro was born in 2472 BE, and ordained in 2493 BE at Wat Don Sala, after the death of his Father. Luang Por Sri Ngern passed away in the year 2543 BE on the 24th December, at the age of 72 years old, after 51 years of ordained life, leaving the Wicha Inheritance to the next abbot, Luang Por Utai to continue and preserve. Por Tan Nam of Wat Don Sala (Pattalung), was one of the Great protagonists of the Samnak Dtak Sila Khao Or School of Sorcery, and one of the Greatest Guru Masters of the Southern Thai Provinces of all History. Wat Don Sala, and the amulets which come from this temple from all Masters, are highly Eminent in the Khao Or Legend, both as a temple in its own right, as well as for the collaboration with the making of some of History's most prestigious Amulets with this Grand and Large family of Sorceror Monks, who stem from a number of Famous temples within the Khao Or Tradition. Below; Inscriptions in Khom Agkhara of the Yant Putsoorn (Na Mō Put Tā Ya) and the letter 'U' are inscribed as a magic spell on the rear face. This use of Sacred Yantra to seal the rear faces of amulets and Takrut Charms is called 'Pratap Hlang' meaning 'to cover the rear'. The Pra Yord Khun Pol amulet was evr so famously renowned amulet from Por Tan Nam, which was passed to Pra Ajarn Sri Ngern, who continued the same design factors, and creation methods, according to the Wicha of Khao Or. The amulet is empowered with the Wicha Pra Yord Khun Pol, containing Invocations to summon the power of Kong Grapan Chadtri, Klaew Klaad, Maha Amnaj (commanding power and influence) and Serm Yos Status Promotion Magic. The front face of the amulet bears the Image of a Buddha setead in Mara Vichai Posture. The two Savaka, Magdalyayana and Saributra are standing either side, one holding a 'Chadtr' Parasol to shade the Buddha. Pra Yord Khun Pol is one of the Classic Historc Periodic Amulets which has its own 'Benjapakee' five regions set of 'Pra Niyom' preferred amulets, and is famed for its Serm Yos (Increase Status), Kong Grapan Chadtri, Klaew Klaad, and Maha Pokasap - Maha Lap powers. There are various forms seen in various regions who made the Yord Khun Pol amulet, with five of them becoming the most preferred, hence they also carry the name, 'Benja' (meaning 5) and 'Pakee' (Benjapakee). Pra Ruang Rang Pern - Wat Pra Sri Radtana Maha Tat (Sukhothai Province), Pra Huu Yaan - from the Kru Burial Chamber find at Wat Pra Sri Radtana Maha Tat in Lopburi, Pra Chinarat Bai Sema, from the Kru Burial find at Wat Pra Sri Radtana Maha Tat, in Pitsanuloke, Pra Mahesworn, from the Kru burial archeological find at Wat Pra Sri Radtana Maha Tat, in Supanburi, and the Pra Ta Gradan, from the famous Kru Burial find at Sri Sawad, considered to be an amulet that is over 500 years since its making. Chant Maha Namasakara (Namo Tassa Bakawadtō Arahadtō Sammā Samputtassa) Three times first, as usual before chanting to amulets. Chant once in the mornings for Metta and Choke Lap.